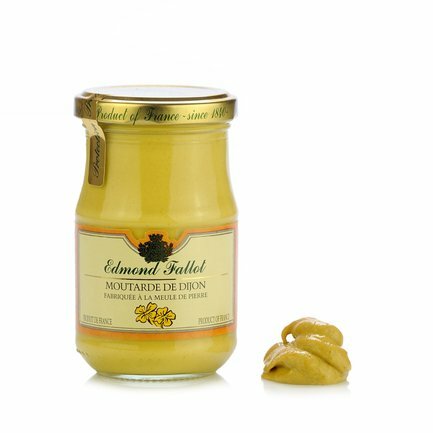 Mustard seeds, vinegar, salt...and the experience of Edmond Fallot: these are the secrets of this delicious Dijon Mustard that Eataly has carefully selected for you. Try it as an elegant sauce together with your favourite dishes to enhance and enrich their flavour. Ingredients Water, mustard seeds, vinegar, salt, antioxidant: potassium metabisulphite; acid: citric acid; spices. ALLERGENS: sulphites (potassium metabisulphite) and mustard For more information on product labels, please contact our Customer Service department. The information on the labels of the products may vary for reasons beyond our control, therefore, there may be discrepancies between the information on the site and that on the products delivered. Please always check the information on the product before consumption or use.